The campground was peaceful and mostly empty. The tall Douglas fir trees overhead promised shade from the hot sunny day, and the quiet trickling of the nearby creek would surely lull us to sleep that night. Arriving at our campsite, though, we were dismayed to find trash. Lots of trash. Toilet paper in every patch of grass, bottle caps, applesauce pouches. Old diapers were in the fire pit, along with plastic cups and styrofoam plates. This is how our family’s outdoor motto began: Leave it better than you found it. That day, my kids and I spread out with plastic bags and collected everything that was sanitary enough to touch. I emptied the trash from the fire pit; we didn’t want to burn all those chemicals and have to smell it as it burned. My kids picked up all of the applesauce pouches, bottle caps, and potato chip bags. We cleaned the campsite, not just for ourselves, but for everyone who would be using that site after us. And, quite by accident, we started our own movement. Of course, we aren’t the first to come up with this idea. Leave No Trace has been advocating for cleaner trails and campgrounds for years. Clean Trails has the same idea: what if everyone just picked up one piece of litter? Our idea for our family is that not only do we not leave any trace of our visit, but we also leave it better than before. Even if we each pick up just one bit of litter, it’s better than it was. How do we leave it better than we found it? We usually have plastic grocery sacks with us for our own trash, so we use them for litter that we find, too. Or if waste cans are available, we just throw it away properly. The first step is to not leave any trash of your own. Every tiny corner of granola bar wrapper, broken zipper pull, every water bottle cap needs to be packed out, for all of us. And might as well be taking your own reusable water bottle anyway, you’d never forget a Yeti cap! Picking up trash is a lot easier if you have a bag in your pocket to hold it. We don’t usually pick up much litter actually on the trails, but if we do, it’s on the way back to the trailhead so we don’t have to carry it as far. Now I try to always have a grocery bag tucked into our pack. They come in handy for lots of things anyway, and being prepared helps us to be better citizens. I have each of my kids pick up 3 pieces of trash. I never ask them to pick up anything dangerous, sharp, or unsanitary. They choose what they pick up, and I don’t worry about what they choose. If one of my children only chooses 3 bottlecaps, well, that’s 3 fewer bottlecaps on the ground. I use the number 3, but the number doesn’t matter. One piece is better than none, and any amount of litter thrown away properly is appreciated by those of us who don’t have to look at it later. Often, we make it into a game. Who can pick up trash the fastest? Who can pick up the most trash? My kids see the need for this, and they willingly participate. Afterwards, the reward for their effort is immediate: they can see the difference they’re making. Our entire family helps. We have 4 children and 2 parents. If each of us picks up just three pieces of litter, that can make a huge difference! Our youngest child is 4 years old, and he loves to help find trash and put it into our bags. Trailheads tend to be the grossest, but when we arrive to a trail, we’re excited to get going. However, when we return to our van, there’s always a lag time of 10-15 minutes while we tend to the little ones and load up the van. This is the perfect time for the older kids to pick up litter. I think my favorite part of our family’s hiking motto is that anyone can do it. Just one piece. We’re not cleaning entire trails (though someday I’d love to!) or hauling out garbage bags of trash. We’re picking up just one piece, or three. Imagine if everyone did? 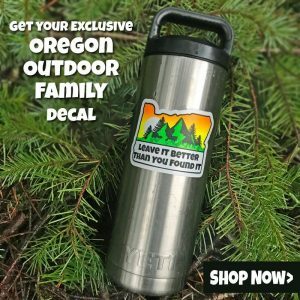 If you’d like to buy one of our decals for your car, water bottle, etc, visit our store to buy one with free shipping (US addresses). Our decals are professionally printed at Sticker Mule on die cut vinyl. They’re weatherproof and fade proof, so feel free to use it on your vehicle or water bottle. Two sizes that are perfect for almost any application. Small size (3′ x 2.25″) is $2 shipped. Medium size (4″ x 3″) is $3 shipped. Visit our store to purchase. Like this post? We’d love a Pin! Thank you! It’s so important, not just to do it ourselves, but to teach our kids. Absolutely adore this motto, we never leave rubbish in places we visit but also love the idea of helping clean up a bit. Love this! The sticker design is beautiful as well. We travel to Oregon every couple of years – love the area so much!